Is A Celery Diet Effective? The main problem with a celery diet, or any other diet for that matter, is that excessive reliance on a single food item for the purpose of losing weight is seldom a good idea. Except in extreme cases, best monitored by a doctor or licensed nutritionist, a diet should include a good balance of healthy foods. If some otherwise healthy foods need to be eliminated from the diet in the name of weight control, other food items should be added or eaten in greater amounts. A diet plan revolving around celery might make sense in some cases, if other food items are chosen appropriately. Negative Calories, And Other Things As Well - Celery is not the most nutritious of vegetables although it does contain some rather important nutrients. Celery is quite rich in Vitamin C and is also a good source of dietary fiber and contains a number of important minerals and trace elements. The same can be said of course for many fruits and vegetables. Those promoting a celery diet generally key in on one factor. Celery is a so-called negative calorie food. It has been proven that it requires more calories to digest a stalk of celery than are contained in that stalk. If you eat only negative calorie foods, you are going to lose weight as you net intake of calories on a daily basis will be negative. So, eating celery seems like a good way to lose weight. It is a way to lose weight, though not necessarily a good one. A diet of celery and water would be the equivalent of fasting. As we know, fasting is good for us when done for short periods on an occasional basis. 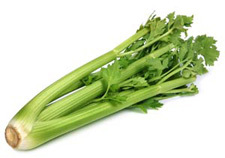 Besides water, which we must have, celery would provide a few nutrients which water alone of course will not provide. Over an extended period though, celery and water would not provide nearly the number or amount of different nutrients our bodies require. Celery does not contain many of the vitamins we need, only a few of the minerals, and virtually none of the amino acids essential to our good health. One might lose some weight, but it would be the equivalent of a crash diet which is not good for anyone. Celery For Breakfast - Again - Just the thought of celery and water can make one hungry for something else. By the second day of the diet, one would probably start looking for a dip for the celery sticks. That would certainly add to the flavor and give a feeling of fullness, but the negative calorie plan just went out the window and you'll find yourself not enjoying the celery diet and not losing weight either. If you do succeed in sticking to celery only, once your diet is done with and you've lost the weight you wanted to lose (and probably your good nature as well), as soon as you go back to a regular healthy diet, you'll start putting the weight back on. Dieting which involves a very restricted number of food items is seldom a good or workable idea. If You Must Diet, Do It Right - Rather than seeking our negative calorie foods, consider exercise as a means to burn off more calories than you consume. The best way to lose weight, and keep it off, is to lower the amount of calories in your diet, but not drastically, and combine this with a program of exercise. Instead of making rapid weight loss the goal, make incremental, steady, and permanent weight loss the goal. Celery has its place in a healthy diet. It is indeed a negative calorie food and it does provide nutrition, but it won't do the job alone. A diet consisting of fruits, vegetables, and grains, in addition to celery, is far more effective than a purely celery diet ever could be.